When your cat has a sensitive stomach, they’ll let you know… and it’s not always fun. A high fiber cat food can help with various stomach issues (barring other sources like parasites) and make everyone’s lives easier! Our review list covers a range of different options to help you choose the best option for your feline companion. But before you go to the reviews, check out these cat food features to consider while you shop! Type: Dry food is high-value concentrated nutrition, but wet food can help indoor cats stay hydrated. Age Range: Different cat foods are designed for kittens, adults, and mature cats and their age-specific dietary needs. Grain Free: If your cat has a suspected grain intolerance or allergy, going grain-free can do a lot for their digestion. Weight: How much are you getting? Comparing value across brands is easier when you can compare the weights! Ingredients: Some cats prefer different main ingredients (like chicken or fish), or don’t tolerate certain proteins well. Probiotics: Besides fiber and prebiotics, some cat foods provide probiotic supplements for an extra GI boost. Now that you know what to look for, let’s get into the reviews! The top pick and budget pick are the must-reads if you’re in a hurry, but check out our other high fiber cat food reviews to compare all of the great options out there. Let’s dig in! The top pick in our high fiber cat food review is Royal Canin’s Gastrointestinal Fiber Response dry cat food. 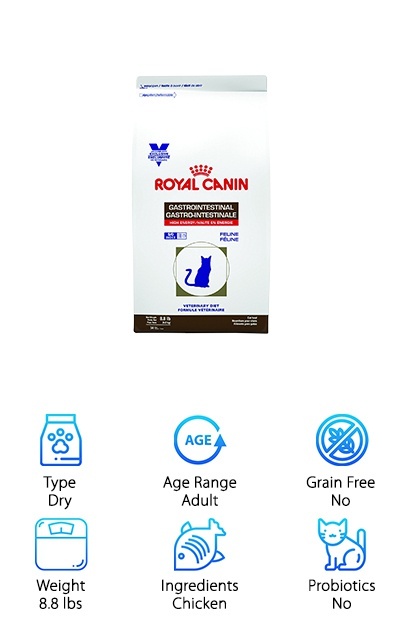 It comes with the added benefit of the Royal Canin S/O Index, which helps prevent bladder stones. EPA and DHA support brain health, plus other vitamins and minerals add up to a complete diet for your favorite feline. It has 29% crude protein from chicken by-product meal and 4.7% fiber from ingredients like psyllium husk and prebiotic FOS. 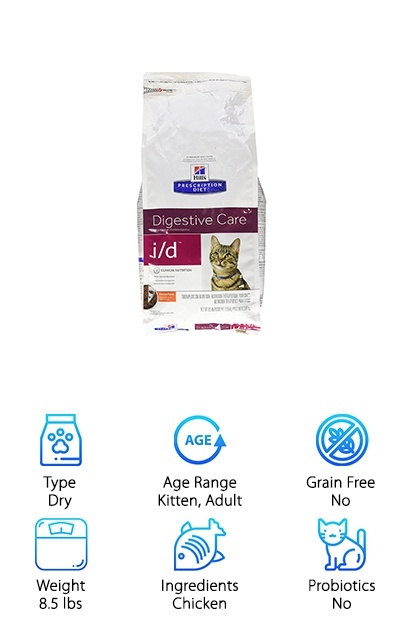 If your cat is struggling with intestinal issues or is prone to bladder stones, this dry cat food is a good feeding option. It can help keep their digestive system in balance. Whether it’s constipation, vomiting, or other issues, a high fiber diet designed for sensitive stomachs can help make things easier for you and your cat! Just remember this recipe is designed for adult cats, not kittens. This formula from Hill’s Science Diet for indoor cats comes in recipes for kittens, adult cats, mature cats 7+ years old, and senior cats 11+ years old. As your cat ages, their dietary needs change. The adult recipe contains 33.8% crude protein and 9.1% fiber--that’s significantly more fiber than many other brands offer! Immune system support comes from an antioxidant blend of vitamins C and E, plus other vitamins to support every other aspect of your cat’s health! Tailor your cat’s food to their age and environment while giving them a boost of fiber for improved digestion. No artificial colors, flavors, or preservatives, either, so you can avoid ingredients that may irritate a sensitive stomach. It’s all made in the USA and guaranteed to satisfy! It’s no wonder this made it as our pick for the best high fiber cat food with a low price and a great value! 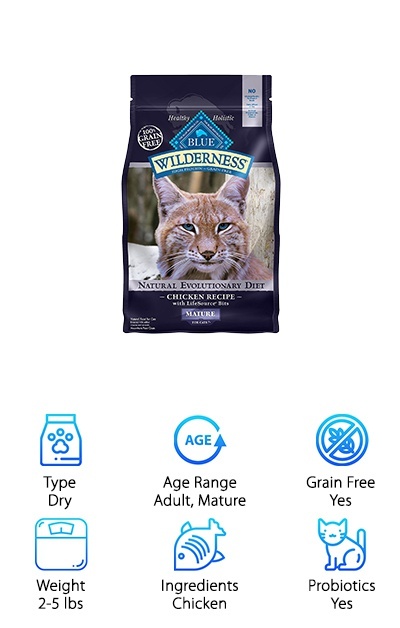 Blue Wilderness Chicken Recipe for mature adult cats is one way to transition away from corn, wheat, soy, and other common cat food ingredients that may not play nice with sensitive stomachs. With a 38% crude protein level and 5% fiber, this holistic cat food high in fiber provides a lot of nutrition, too! Deboned chicken, chicken meal, and turkey meal are the main protein sources, and peas and potatoes provide carbohydrates and fiber. Vitamins and minerals are built into the LifeSource bits, helping meet all of your cat’s nutritional needs. Plus, probiotics provide an extra boost to your cat’s digestive system. Other supplements include omega fatty acids and DHA for brain health. 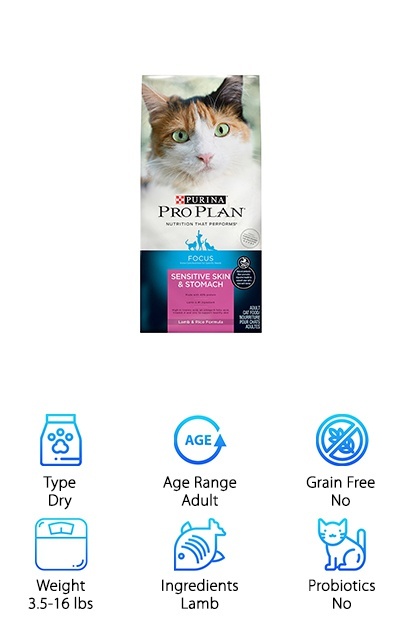 If you want a grain-free cat food designed for the needs of an older cat, you may like this holistic dry cat food with no animal by-products. It’s high in fiber and high in nutrition and flavor! The Iams Proactive Health Healthy Digestion cat food comes in a tasty chicken flavor and a boost of fiber at a great value price. Beet pulp and prebiotic FOS provide fiber content (up to 3%) to help your cat absorb more nutrients from their food. Chicken by-product meal and chicken offer 33% crude protein content. Antioxidants and vitamins bump up the nutrition to provide a complete healthy diet for adult cats. These include supplements of biotin, vitamin D3, B vitamins, omega fatty acids, and more. If your cat is a fussy eater or seems to digest their food too “quickly,” this high fiber cat food can help slow things down so they can digest their food more thoroughly. Keep in mind this dry cat food is designed for adult cats, not kittens. 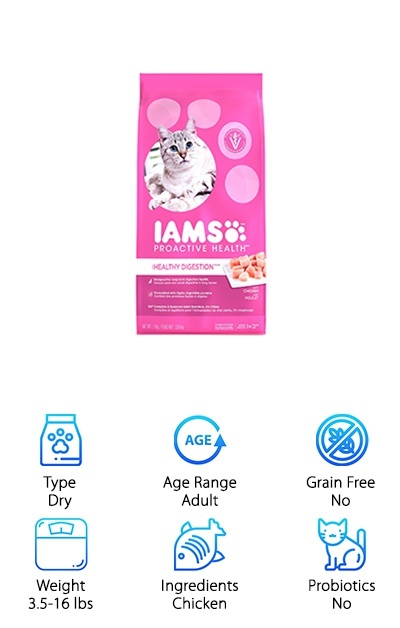 If you’re looking for an inexpensive cat food with high fiber content for cats with sensitive stomachs, this Iams Proactive Health recipe is a great option! Halo Natural Dry Cat Food “Spot’s Stew” Holistic Seafood Medley recipe provides some tasty alternatives to chicken and chicken meal. Salmon and trout are unique and easy to digest protein sources. Follow that up with oats, pearled barley, whole peas, and flaxseed for carbohydrates and fiber (adding up to about 5% fiber content). It has a crude protein content of 32%, and this highly digestible dry cat food finishes things up with probiotic supplements. No artificial colors, flavors, or preservatives helps you to cut out even more potential irritating or allergy-causing ingredients from your kitty’s diet. 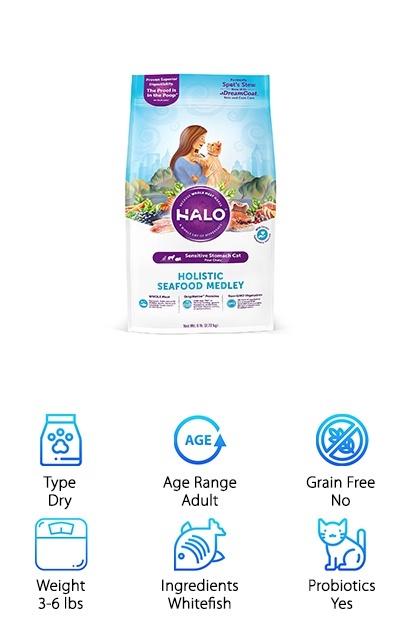 Plus, if you want an ethical source for your cat food with no factory farming or GMOs, Halo has some good options for the environmentally conscious. Also, if you want to avoid meat meals in favor of whole proteins, Halo proudly only uses whole holistic meats in their pet food recipes. Some pet parents prefer to feed wet food--and cats in the wild usually get most of their water from their prey. For some cats, wet food works just as well as a high fiber cat food for constipation. This formula from Halo is designed for sensitive stomachs with unique whole quail as well as chicken. 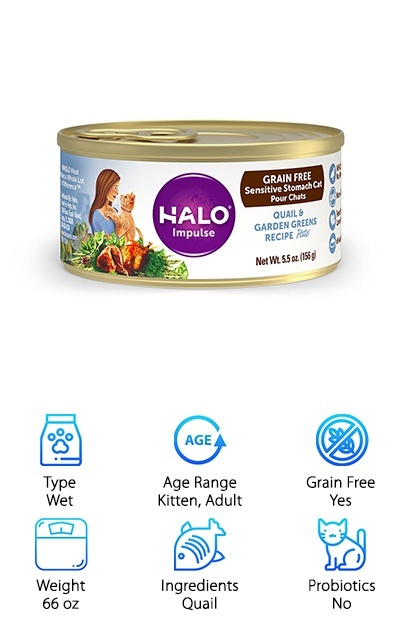 Although meat meals aren’t necessarily bad, the Halo Holistic Wet Cat Food Quail & Garden Greens Pate contains only whole meats and is grain-free on top of that! This canned cat food comes in a 12-pack of 5.5-ounce cans with easy-open tab pulls. There are no artificial colors, flavors, or preservatives, and avoiding corn and other grains can help with ingredient sensitivities and allergies as well. This complete diet can be fed to kittens and adult cats. It smells and tastes delicious on top of being easy to digest, so your kitty will find it hard to resist! Purina is a solid brand choice for high-value, well-formulated pet foods, and they even have a formula made just for kitties with digestive issues! The ProPlan Sensitive Skin & Stomach Lamb & Rice Formula provides 40% crude protein and 4% fiber. The main protein source is lamb, which is super easy to digest, followed by chicken. Rice and oatmeal are easy to digest, and prebiotic fiber encourages complete digestion. 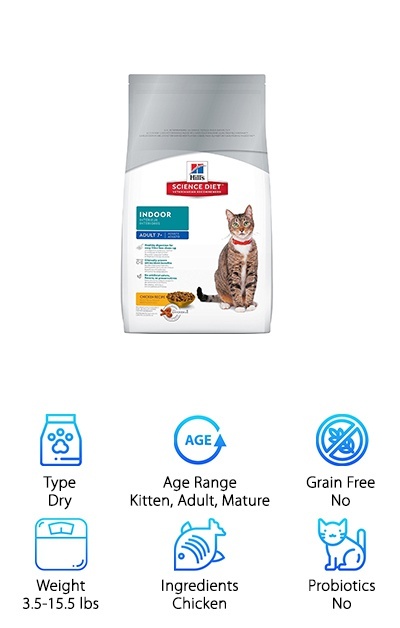 It provides totally balanced nutrition for adult cats (not designed for the needs of kittens) and has a higher-than-average protein content for a dry cat food. This Purina formula also provides a minimum level of omega fatty acids and antioxidants. If your cat doesn’t seem to be responding well to their current diet, switching to a sensitive stomach formula may help. Skin issues can also be addressed with a diet change. And with Purina, you don’t have to break the bank! 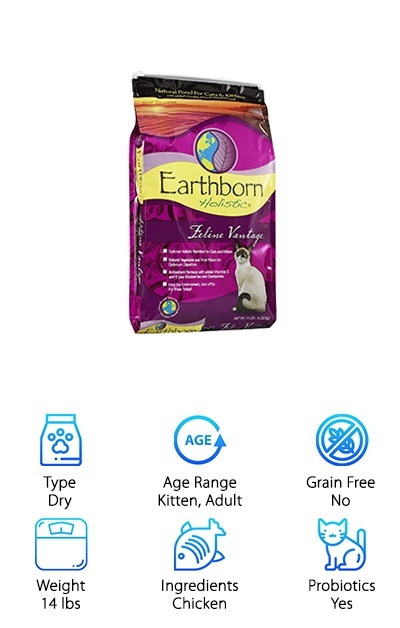 Earthborn Holistic Feline Vantage dry cat food provides a variety of natural fiber sources as well as probiotics to support healthy digestion. It provides a minimum of 36% crude protein and 5% fiber. Rice, oatmeal, barley, flaxseed, and fruit fiber extracts are a few of the fiber sources. Plus, several different probiotics add another boost to your cat’s digestive health to help “balance” the good gut bacteria they need. There is also a set level of omega fatty acids to support healthy skin and glossy fur. If you’re looking for a cat food with fiber and probiotics, this natural option is a great choice! It also doesn’t have corn, soy, or wheat ingredients, which are common pet food allergens. This cat food is also designed to be environmentally responsible, which is a nice touch! This complete diet provides a good balance of basic nutrients plus bonus supplements to encourage total feline health. 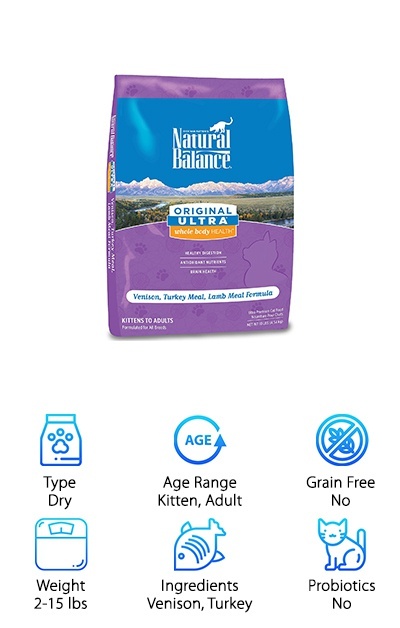 Natural Balance Ultra Whole Body Health dry cat food isn’t specifically formulated for cats with digestive issues, but the gluten-free formula can be helpful to cats with sensitive stomachs. The Venison, Turkey Meal, & Lamb Meal formula contains no corn, wheat, or soy ingredients. It provides carbohydrates and fiber from brown rice, oats, pea fiber, and oat fiber. High-quality protein from venison, turkey meal, chicken meal, lamb meal, and more provides a minimum of 34% crude protein. It also provides antioxidants and minimum levels of omega fatty acids to add a boost of nutrition. DHA and EPA are also supplemented to support brain health. If your cat seems to have some mild digestive issues, a simple change to a high-quality cat food can help. Beyond providing a complete diet for your cat’s nutritional needs, this Natural Balance cat food is made with the good stuff, no fillers! Hill’s Prescription Diet i/d for Gastrointestinal Health is a dry cat food for adult cats. This diet provides complete nutrition for your feline with a boost of fiber from a mix of sources. Although it doesn’t contain probiotics, it is formulated to be easy to digest and gentle on the stomach, which can help your cat’s natural good gut bacteria flourish. Antioxidants and vitamins support a healthy immune system, and the formula is also designed to reduce the risk of struvite and oxalate stones. Keeping your cat’s diet well-balanced can help prevent the formation of bladder stones. The formula can be fed to adult cats and kittens with digestive issues. It contains 32% minimum crude protein. If you’re worried about grains, keep in mind that this formula is not grain-free. This recipe provides nutrients that are easy to absorb, which is especially helpful if your cat has been vomiting.